“The development of printing machines has passed the stage of how to print the fabrics more beautifully, meeting the basic needs of printing. 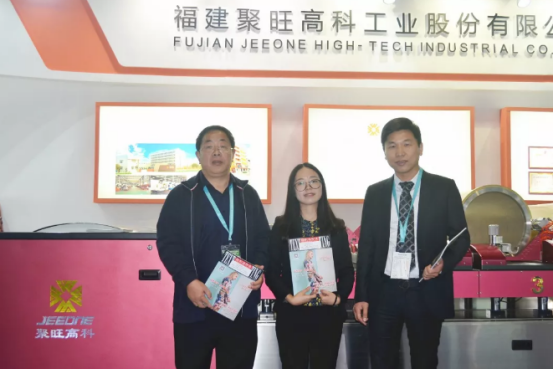 It now has two new development directions: intelligent and environmentally friendly.” The general manager of Fujian Jeeone Hihg-tech Industrial Co., Ltd. Xu Jiaming said. Fujian Jeeone Hihg-tech Industrial Co., Ltd. (hereinafter Jeeone Hihg-tech”) was established in 1994, which is a national high-tech enterprise specializing in R&D, manufacturing and sales of printing and dyeing machinery and intelligent environmental protection equipment. In recent years, Jeeone Hihg-tech responded to the call of “Made in China 2025” proposed by the state, taking intelligent and green as the direction of transformation and upgrading, taking the lead in arranging smart and environmental protection strategies and strengthening the research and development of intelligent technologies. Now Jeeone Hihg-tech has successfully entered the harvest period. Their products are favored by customers at home and abroad, and have brought changes and innovations to the printing and dyeing industry, winning many national, provincial and municipal awards. Jeeone Hihg-tech's latest super-extra width format cloud computing carpet rotary screen printing machine is one of the results of its intelligent upgrade in the field of printing and dyeing. Wang Siqing, senior chief engineer of Jeeone Hihg-tech, pointed out that the biggest highlight of the printing machine is the practical and humanized requirements through the implantation of intelligent technology. Super-extra width format cloud computing carpet rotary screen printing machine adapts to a variety of different fabric varieties, printing width of 4.4 meters, the fabric printing thickness of 3 mm (weight 1600g/square meter) carpet; humanized design like automatic washing device, electric belt tensioning device and register homing system completely liberated the hands and saved manpower. The machine has a high degree of automation, and the operation is simple and convenient, and one person can complete the whole operation. Wang Siqing said that this model with a number of exclusive patents is a product compared with the advantages and disadvantages of all the printing machines at home and abroad and based on the shortcomings. The machine structure is stable and reliable, and the advantages are obvious which is suitable to actual production needs. Under the tide of economic globalization, many Chinese companies have gone abroad to transport their products to overseas markets. However, for mechanical equipment, overseas after-sales service is a difficult problem, because the amount of investment required to set up the after-sales point is not a small sum of money. When others are still worried about how to make overseas after-sales service, Jeeone Hihg-tech has already realized the “Borderless Service” by using cloud computing remote control technology. Xu Jiaming, general manager of Jeeone Hihg-tech, told reporters that their cloud computing control management platform can remotely monitor and control the operation of the printing machine, including remote diagnosis of faults and hidden dangers, remote repair, remote guidance of customer operations, and remote upgrade of the system. "The huge-crowd strategy that everyone pursued is a waste of manpower and material resources, and the service response time is also slow. Now we can maintain and repair the machine through computer networking. You don't have to wait for a visa, you don't have to buy a ticket, you don't have to rush to the scene, and the problem will be solved.” This technology enables fast and efficient after-sales service and saves unlimited costs, Xu Jiaming is very proud of this. The products can provide borderless services, and with high product positioning, strong configuration, and low price, they are well received by overseas markets. Jeeone High-Tech's business is also export-oriented, leaving its reputation in 27 countries in Europe, South America and Southeast Asia. With this obvious advantage of this service, Jeeone High-tech will be able to gain a foothold in overseas markets and open up a broad blueprint. The domestic environmental protection revolution is being carried out vigorously. Jeeone Hi-Tech is also at the forefront of environmental protection, responding to the call of “Blue Sky” and practicing the production of green products. Its latest rotary screen printing machine can collect and process the slurry in a concentrated manner. The design of the spray washing method saves 70% of the water compared with the traditional method. 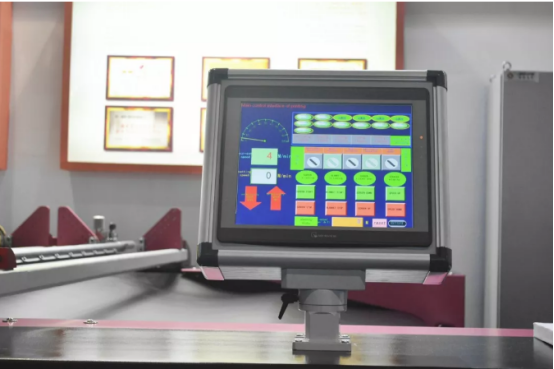 The three-point positioning function realizes the automatic recovery of the flower position, and the machine stop and the screen changer do not need to be registered again. 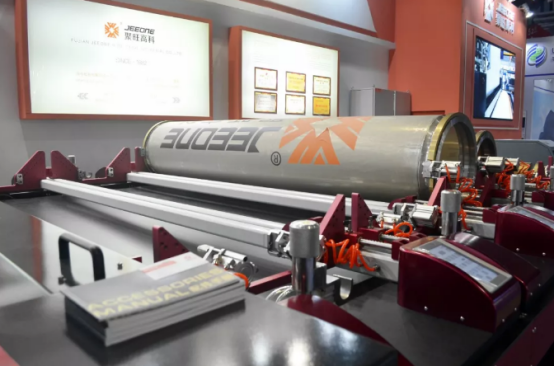 The printing equipment incorporating with intelligent elements has improved the quality and performance, and has also successfully reduced the waste of labor, water, electricity, pulp and fabrics, and has remarkable energy saving and environmental protection effects. In addition, Jeeone high-tech also introduced the national “Thousand of People Plan”, organized and developed the exhaust heat energy recovery and purification treatment system to protect the green environment. It is reported that the exhaust gas collection rate of the system is over 98%, the total particulate matter removal rate is 99%, and the lampblack removal rate is 98%. 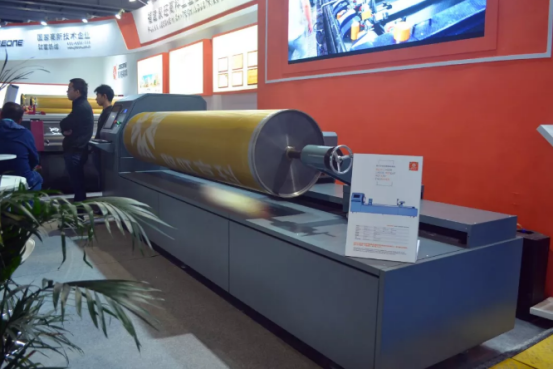 Efficient purification of waste gas, recovery and recycling of thermal energy, was included in the "CNC generation" demonstration products in Quanzhou. It is not only suitable for the use of the rotary screen printing machine of Jeeone high-tech, but also the hope for the entire printing and dyeing industry to deal with exhaust emissions. The trial results of some printing and dyeing companies show that it has greatly improved the production environment of the factory, and there is no longer any smell and smoky smoke any more. "We hope that this exhaust gas treatment system will be further promoted so as to make the environment better. The next research direction of Jeeone high-tech is to achieve zero emission of waste gas and waste water, and carry out environmental protection to the end." Wang Siqing said. Digital printing is regarded as the “new blue sea” of the textile industry. Many traditional printing and dyeing enterprises have begun to transform themselves into the digital printing industry. 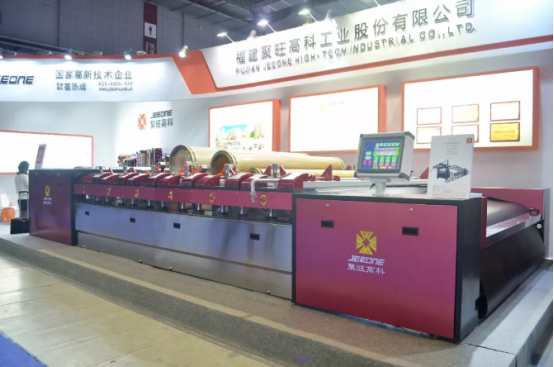 In recent years, the number of digital printing machines exhibited at domestic and international printing professional exhibitions has also increased. However, Wang Siqing believes that although digital printing is the future development direction, textile fabrics are varied, digital printing has certain limitations in terms of permeability and post-processing, and the technical maturity is far less than the traditional printing with a long history. So at present, digital printing is only a supplement to the market. The status of traditional printing machines will not be completely replaced for a long time. Xu Jiaming also said that Jeeone high-tech will maintain the consistent "intelligent manufacturing" concept, delve deep into the technology, and strive to make the rotary screen printing machine the most refined and specialized, in order to maintain market share and create intelligent and environmentally friendly high-tech enterprises.